The Jersey Giant chickens we got last summer are quite big, and still growing. The young hens have been laying "pullet eggs" (very small "beginner" eggs) for some time now. Once more we are awash in eggs, though most of them are very small (only our older ladies are laying full-size eggs). One thing we didn't know when we got the Jersey Giants is how readily the hens would go broody. As it turns out, very readily. Two of our young ladies are setting. Not that we're ungrateful for this instinct; far from it. 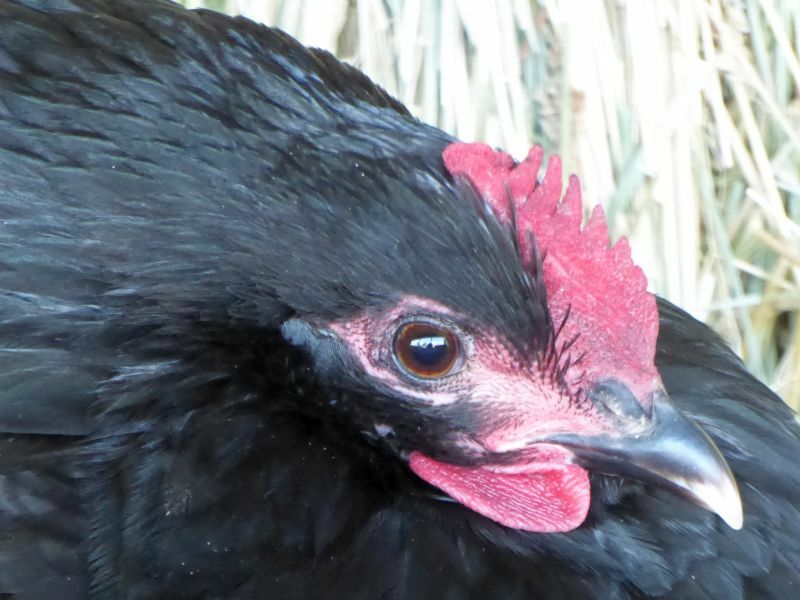 Hens that will go broody are a valuable addition to a farm. But c'mon, girls -- at the beginning of winter? With temperatures in the teens? What are you thinking? I jest, of course. Chickens don't think. It's all instinct. And instinct dictates that when a hen goes broody, she stays broody (for a long while, at least). It's very difficult to "break" broodiness. This young lady has decided to make her nest on top one of the hay bales in the barn. Every morning she flaps seven feet up and settles herself on the nest. And every evening I climb a ladder and gently pick her up to put her in the coop for the night. That's because she's setting on twenty eggs. The way our randy roosters have been acting, I can almost guarantee most of them are fertile. The last thing we need in December is 20 baby chicks to care for. So the eggs freeze solid overnight (temps have been dropping to 11F), thus guaranteeing they'll never hatch. And meanwhile, it gives the hen a sense of duty and accomplishment to set on the nest. The second hen who is setting chose one of the nest boxes in the chicken coop. Since I don't haul her off this nest at night -- thus risking the chance she may indeed succeed in hatching some eggs -- I swiped all the real eggs from underneath her and substituted a selection of wooden "nest eggs." Thus she, too, can get her sense of duty and accomplishment by setting on her nest. After a few more weeks of pointless "duty and accomplishment," the broody instinct will finally fade and the girls will rejoin the flock. However I sincerely hope this instinct kicks in this upcoming spring. As I said, broody hens are valuable things, and I'd welcome their instinct during a time of year when chicks have a chance of surviving. I was looking to get Jersey Giants, but my husband bought Icelandic eggs before I could order mine. I loved this post. Thanks! I never though about them going broody in cold weather! We bought Jersey Giants the first week of April; after culling the rooster that was hard on the hens and the rooster that decided to attack people, I have one rooster and 12 hens. The third week of October one hen went missing and I feared an eagle got her. On 22 November our yellow lab found her. She has built a nest on the south facing dam of the pond, about as far as she could be away from the henhouse and still be on our property. She was on 17 eggs, one of which had tried to hatch. The chick was fully developed, full size in a not quite full size egg. When we put the hen in the henhouse she decided to eat and left the eggs, then got on the roost. We brought her forgotten eggs to the house and candled them. Only six were not fertile. Reading on the Internet about chick death at hatch time, it was brought up in a forum that pullet eggs still result in full size chicks that can't maneuver into position to get out, which seemed to me to be the problem with the chick that had hatched, probably that day. We had kept the eggs warm and moist and decided to see what happened with the other nine eggs in our homemade incubator. We lost power two days later, which coincided with the time limit we had set. That hen disappeared the following Sunday but showed back up on Wednesday and hopefully decided to wait until Spring to go broody. Two others disappeared on Monday and reappeared on Wednesday also. I had to buy store bought eggs this week. I'm inclined to purchase chicks in the spring of a laying breed that doesn't go broody, lol. I have always had one or two bantams because they also go broody and they are diligent in their effort, so what I do is let her set on fake eggs while I also collect the good ones. After about 21 days I will buy babies and do the transfer after dark, I take the fake eggs and replace them with the babies. They automatically go in her wings to stay warm and thus forming the bond. A few days later she will introduce them to the world and become the best of moms. She will keep them in the box thinking they are still wet, I place food and water in the box for the babies. I can only have a small flock due to suburban rules, but it works every time. Ha ha I have some hens that are 1/2 buff orpington, 1/4 black something, and 1/4 jersey giant. They are very pretty and one of them went broody before she even laid an egg. All summer I kicked her off the nest. I have buffs that are setting still but I take the eggs every day. If you were a little closer, I would try to trade you out of a rooster. Seventeen chicks hatched out at our farm this spring - almost all were hens and most were hatched by our Jersey Giants. We have one little bantam hen that someone gave us - named Speedy - that went broody this spring. One of our crazy Jersey Giants kept climbing into Speedy's nest and brooding on top of her! Poor Speedy was mashed underneath this hen that was probably three times her size. The Jersey Giant would not stay off even though we booted her a few times. Eventually we had to separate the two hens and give the Jersey Giant her own clutch. She ended up stealing the majority of Speedy's chicks after they hatched and it was probably for the better. The Jersey Giant was a much better momma. Speedy did okay but we kept finding her poor babies alone cheeping piteously after she'd gone off to feed and had forgotten about them. All our Jersey Giants, though, are great mommas and we find our chicks that have been raised with hens are much scrappier and better behaved than the ones purchased from a hatchery and raised with peers - a little like children! I've read that Jersey Giants are good chickens. I'd be afraid to raise them in the heat and humidity of Louisiana. Good luck this spring. You could have a bunch of chicks running around. Your place looks like you have lots of places for a mama hen to hide. You would be surprised at their effort for their chicks. Let her hatch them if she wants, if only 1 or 2 make it so be it. I have let hens hatch chicks at all times of the year. Sometimes they never get back in the broody frame of mind. I say "you go girl". Hi Patrice, The Black Jersey Giants are magnificent, beautiful birds. And no amount of people telling you ahead of time how broody they are will stop anyone from having them as chickens. Been there, done that. I will always love them but they are truly THE broodiest chickens I have ever seen, and it seems to surprise even the best farmer. I am talking 4-6 months out of 12 that 'The Brood' (hen version of 'The Muse') is upon them. I have extra laying boxes simply because they stubbornly refuse to leave the one they are in for days and days and days and days, and the other girls need to get in to lay an egg. It all falls down when they all want to use the same laying box because Moneypenny & Henrietta have been perched in there forever so it must be the best box, yada, yada, yada. This will pass, but boy does it ever seem like such a long time with them. Thankfully they are so beautiful and serene that they are worth it. Even when they are in 'The Brood' I can easily slide my hand under them to lift and check for eggs. I've never gotten a serious peck from them as I have with other hens. When all is said and done, they are my most faithful layers, and they seem to molt before the other hens so that when they all take many months off for the molt, my black beauties start laying again quite soon to make up the difference. True to the end! ;-) you can tell that God made them for the significant niche they fill. I make sure that their water has lovely liquid minerals to help the process at all stages. My mother in law always said that when her hens went broody, their internal 'thermometer' increased, and she would have to cool the birds off. She would grab up the hens, hold them by their feet and dunk them in the cattle tank a few times in quick succession. She said that this action would drop their core temp, so they would stop being broody. Forgive my complete ignorance. 2 questions. 1. If you take the fertile eggs and replace them with fake eggs that never hatch wouldn't that make the hen less likely to do it again? 2. If the hen is a good mama why not let her hatch and raise the survivors if you just kill them anyway? Sorry. Zero experience and trying to learn. 1. No, it doesn't seem to have that effect. 2. The chicks WILL die because of the cold weather. We've had a few chicks born in winter and it just doesn't work. Dead chicks are far more traumatic to a mother hen that not having eggs hatch. ...and then search by the name "Smoky" in the list of key word on the left-hand side of the blog to follow Smoky's story.